1. Preheat the oven to 220˚C, gas mark 7. Mix the mustard powder with some seasoning and rub over the beef. Put the onion, thyme and garlic in a roasting tin, sit the beef on top. 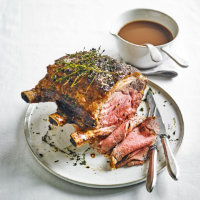 Roast for 20 minutes, then lower the heat to 160˚C, gas mark 3 and roast for 1 hour 20 minutes more (or 15-20 minutes per 500g) for medium rare. 2. Lift the joint from the tin, place on a carving board and loosely cover with foil. Rest for at least 20 minutes. 3. Spoon off the excess fat from the roasting tin, then place on the hob over a medium heat. Pour in the wine for the gravy and bubble, scraping up any sticky bits from the bottom of the tin. Tip everything into a pan with the beef stock and redcurrant jelly or jam. Simmer briskly for 5-10 minutes until syrupy. Season. 4. Carve the beef. Add any juices to the pan of gravy. Bring the gravy back to a simmer, then pass through a sieve into a warm jug. Serve the beef and gravy with all the usual trimmings.